Image caption Beth Narain took this image of David Bowie when she sat near the front at his concert in Hong Kong. It was in 1983 at the Hong Kong Coliseum, she tells us. Fans and those who were lucky enough to meet music legend David Bowie have been sharing their memories, tributes and art work following news of his death from cancer. Many of you told us how he changed your lives with his unorthodox style and music. Image caption Steve Beaumont shared this sketch he made of David Bowie. He said: "Bowie's music has always been a part of my life. Right through from the 60s". 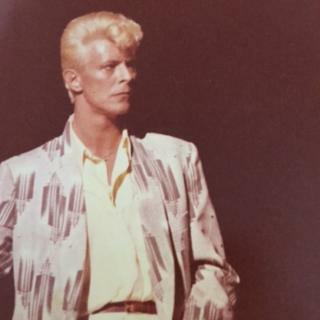 Chris Chappel in Suffolk told the BBC: "I had the amazing experience of being tour manager for David Bowie on his Glass Spider, Sound and Vision and Tin Machine tours. "He was amongst the most charming, creative and talented musicians I had ever worked for in my 30 years on the road. "He had a great sense of humour and was great company, never compromising his art - he was an icon. "I'm rather sad. He touched everyone he met - he was a revolutionary of the heart and mind and never afraid of failure. "I remember we would spend a lot of time on tour buses as he didn't like to fly." Image caption Lawrence Hill tells us: My tattoo was drawn back in 1983; it's the only tattoo I have ever had. I liked that it was hand drawn by the artist, with me sat holding the album cover up whilst he meticulously copied every detail. I was 19 at the time (51 now). Linda Matthews told us: "Mr Jones (David Bowie) was a client of mine in the 80s when I managed an apartment block in Chelsea where the rich and the famous could stay with no risk of the press finding they were in London. "He stayed several times and sometimes his young son, Zowie, was with him. Like many famous people, Mr Jones hated being recognised and rather than eating out he, or his minder Coco, asked me to find a cook. "It seemed best for me to cook and he loved simple fare such as stuffed marrow and treacle tart, to the extent that I was offered a job in his house above Lake Geneva - and I said no! "A boyfriend of mine helped to carry the food up to Mr Jones's apartment and was under strict orders to look straight ahead and never at Mr Jones. "During one stay Zowie obviously wanted to play with friends of the same age and there was a family staying on the same floor with a boy of his age. But the father worked with CBS so there was panic about publicity. The boys won - front doors to both apartments open and an enormous Scalextric track set out from one apartment, across the landing to the other apartment. "And the news of who Zowie's dad was did not get out." Image caption Eva tweeted us to tell us that when she saw Bowie in concert, it was magical. She was 15 years old at the time. She added: "Bowie held a video camera, shooting the crowd in front." Wendy Smith emailed to recall: "He came to the Royal Court Theatre in 1979. I was the usherette on the door upstairs. He came in with a trendy young couple. The only thing I noticed was his flip raincoat - which was uber trendy then. I ripped the ticket and with a nonchalant gesture pointed to the unsparingly uncomfortable seats. Back in the day we usherettes ruled. "I looked to the doorway to see one agitated manager and a gaggle of other usherettes. 'Don't you know who that was?' he hissed. "That was David Bowie. Should have kept the ticket." Image caption A candle lit where David Bowie used to take saxophone lessons. Sonya Dey tells the BBC: "We just moved into the house formerly owned by the legendary saxophonist Ronnie Ross. "Back in around 1960-1962 when David lived in Bromley, he contacted Ronnie Ross on recommendation and, with his pocket money, came for saxophone lessons which took place in our now dining room which was originally Ronnie Ross's music room. So the legend that is David Bowie was born and from there he went on to become who he is today. "We live in Orpington and have today lit a candle in the very room in which David took his lessons. Its quite sad but eerie to know that David as a little boy of 13-15 graced this house with his presence. "We will be applying for a blue plaque in due course to honour his early years and keep his memory alive."